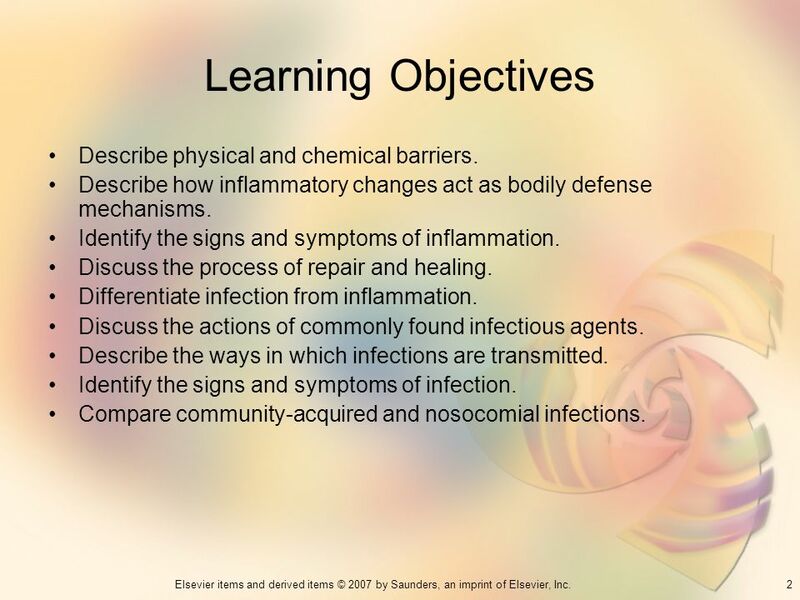 2 Learning Objectives Describe physical and chemical barriers. 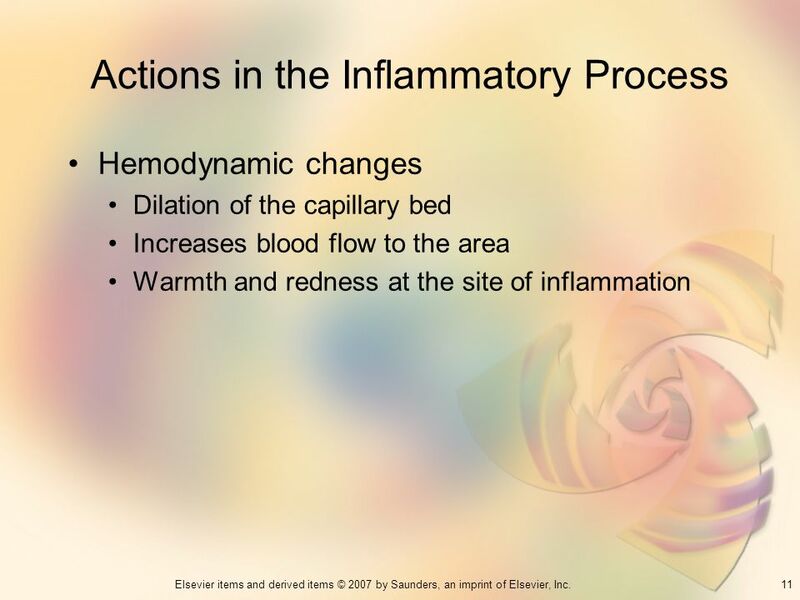 Describe how inflammatory changes act as bodily defense mechanisms. 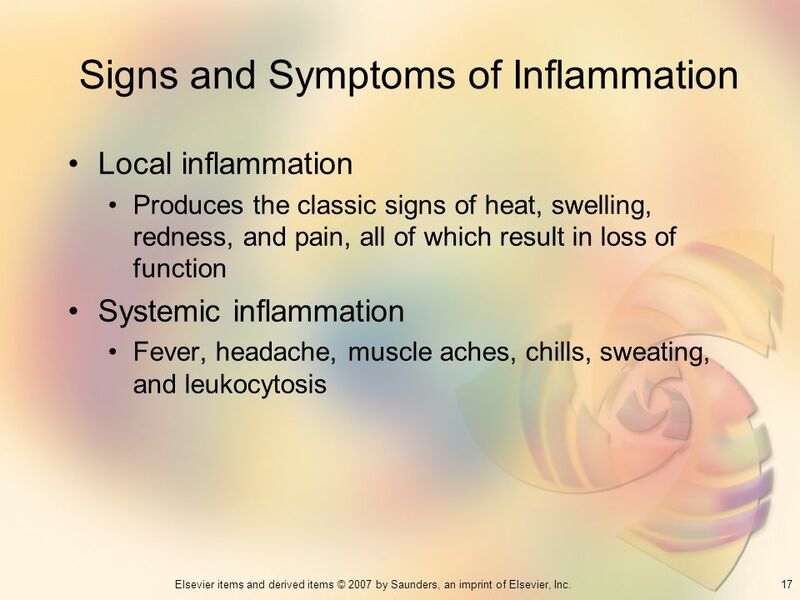 Identify the signs and symptoms of inflammation. 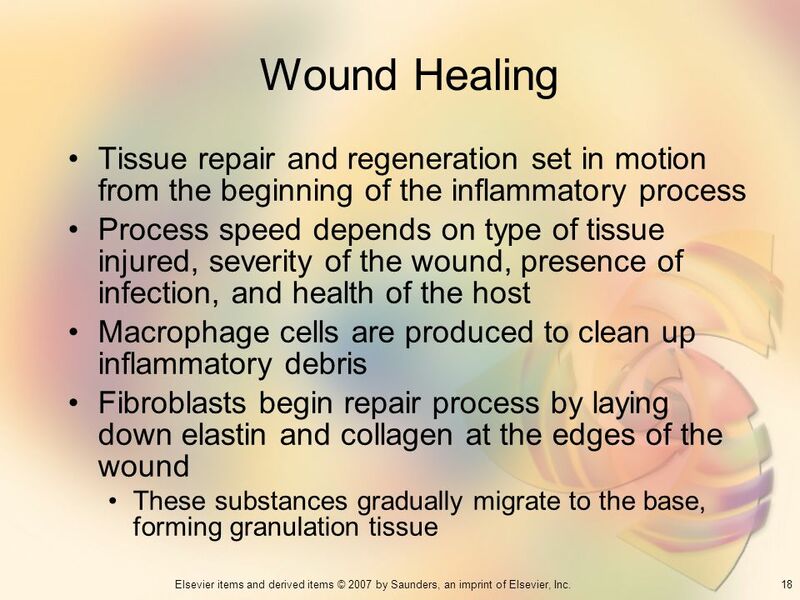 Discuss the process of repair and healing. 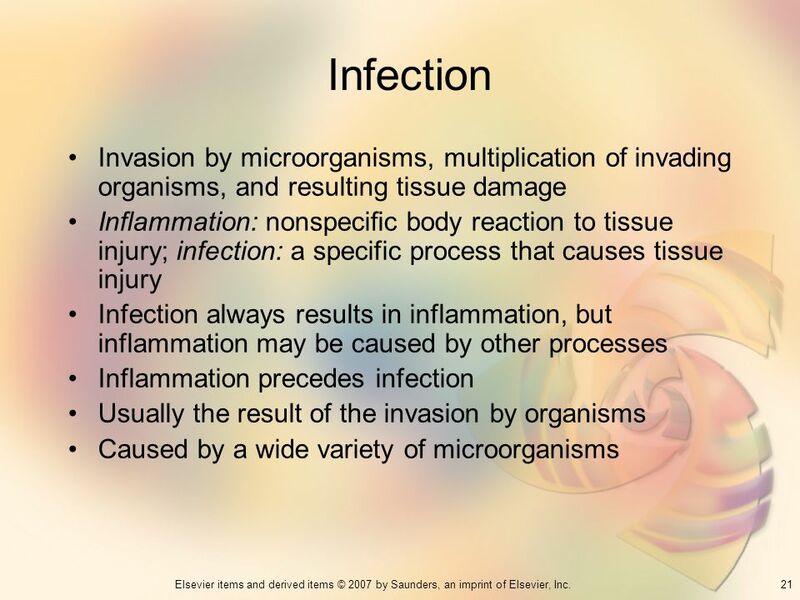 Differentiate infection from inflammation. 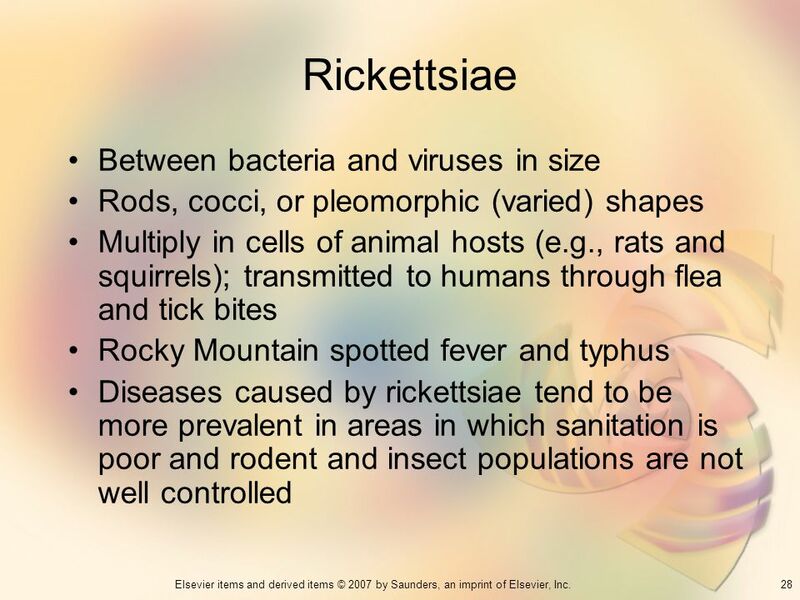 Discuss the actions of commonly found infectious agents. Describe the ways in which infections are transmitted. 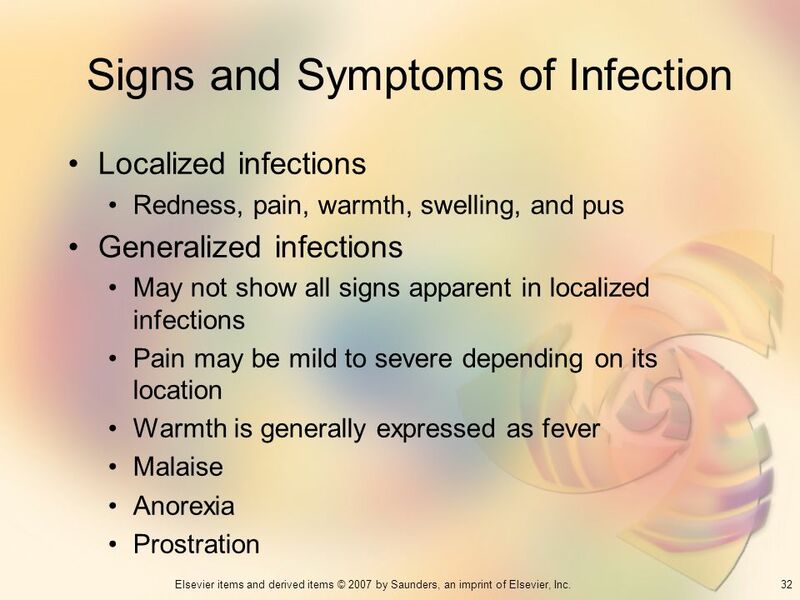 Identify the signs and symptoms of infection. Compare community-acquired and nosocomial infections. 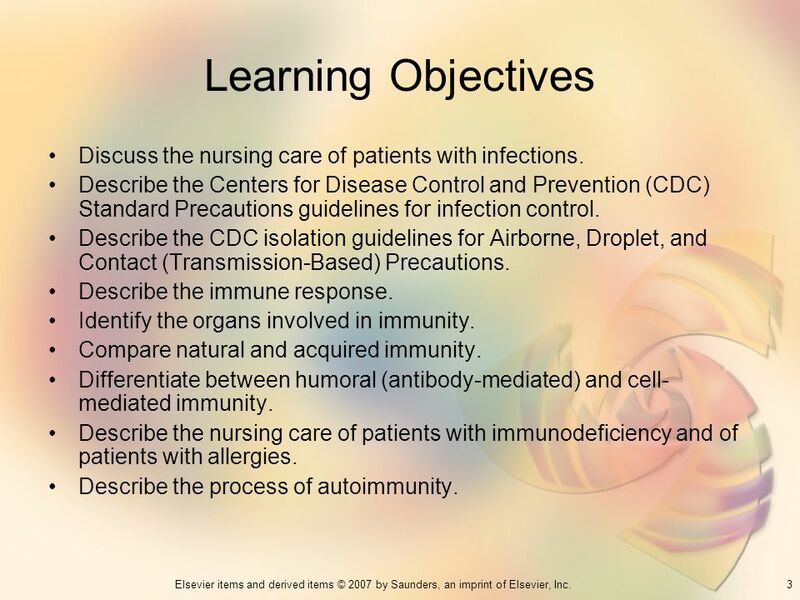 3 Learning Objectives Discuss the nursing care of patients with infections. 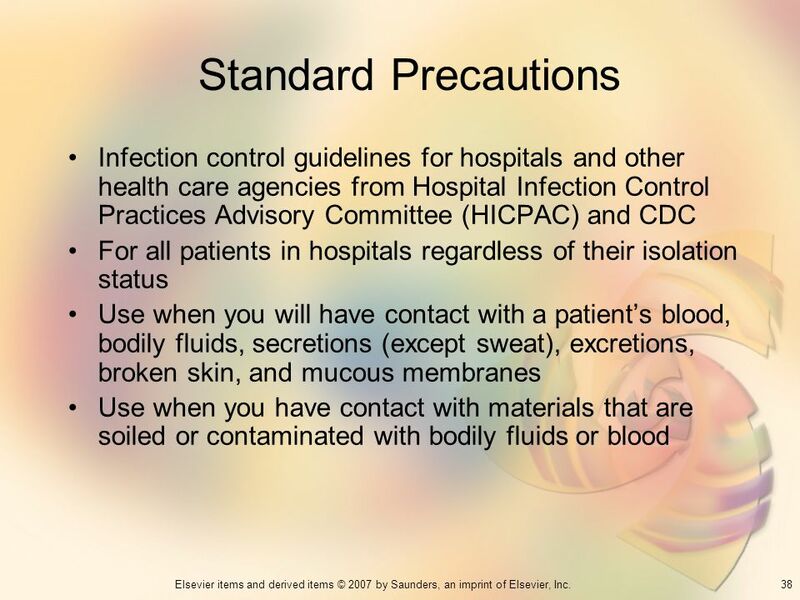 Describe the Centers for Disease Control and Prevention (CDC) Standard Precautions guidelines for infection control. 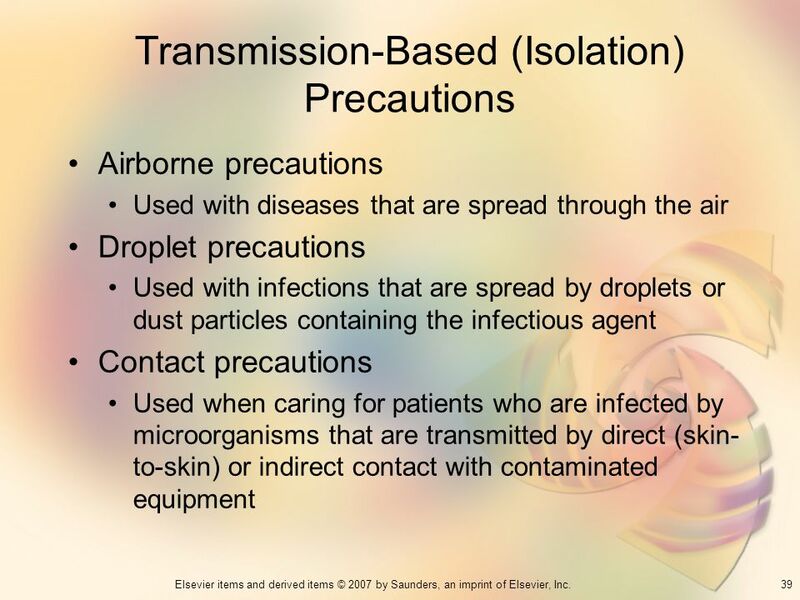 Describe the CDC isolation guidelines for Airborne, Droplet, and Contact (Transmission-Based) Precautions. 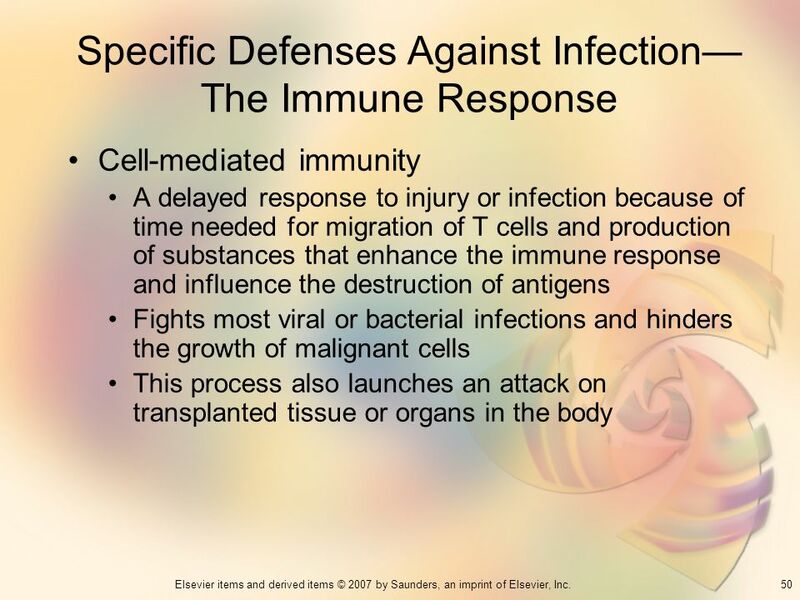 Describe the immune response. 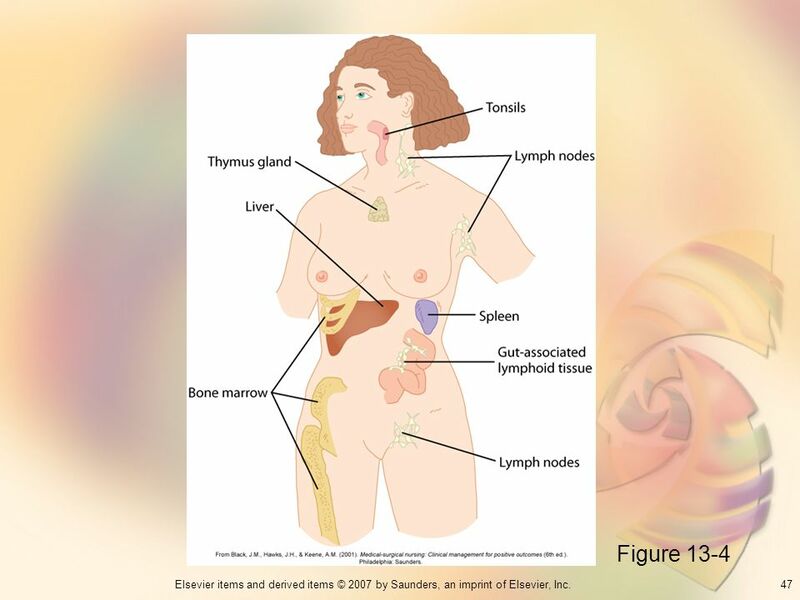 Identify the organs involved in immunity. 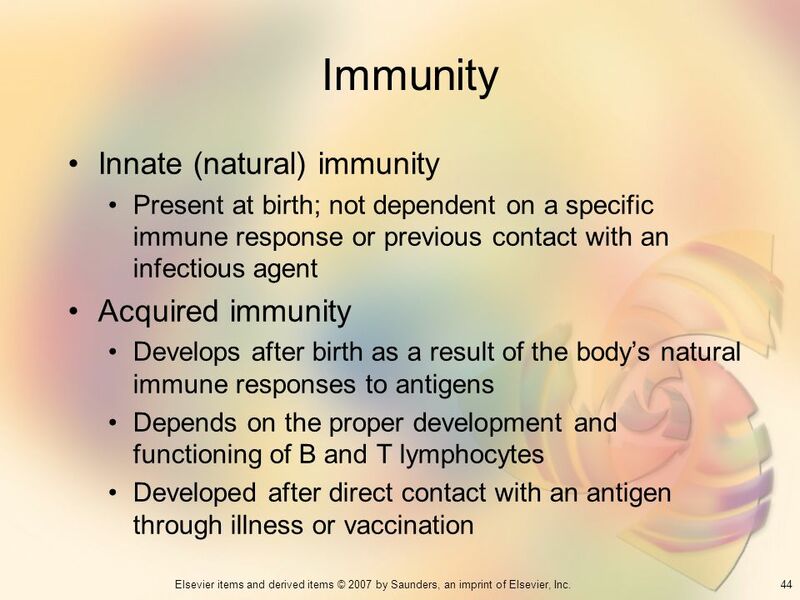 Compare natural and acquired immunity. Differentiate between humoral (antibody-mediated) and cell-mediated immunity. 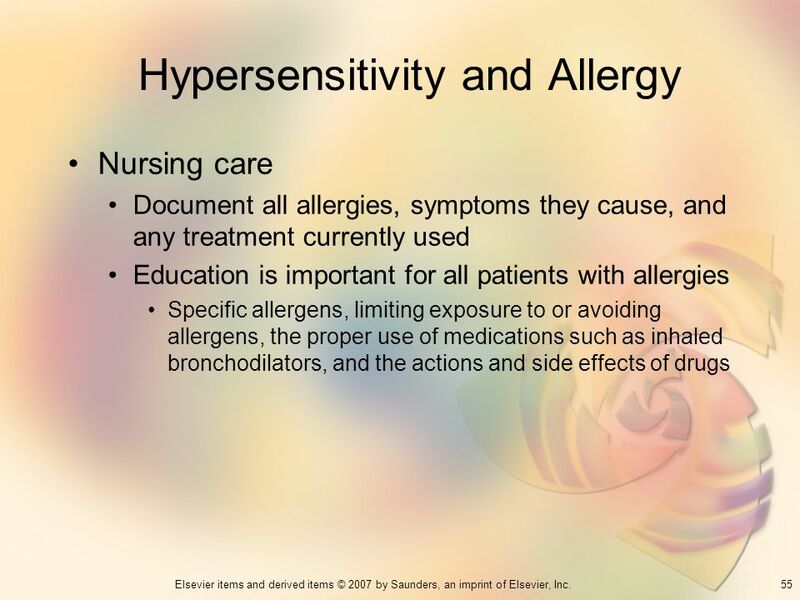 Describe the nursing care of patients with immunodeficiency and of patients with allergies. 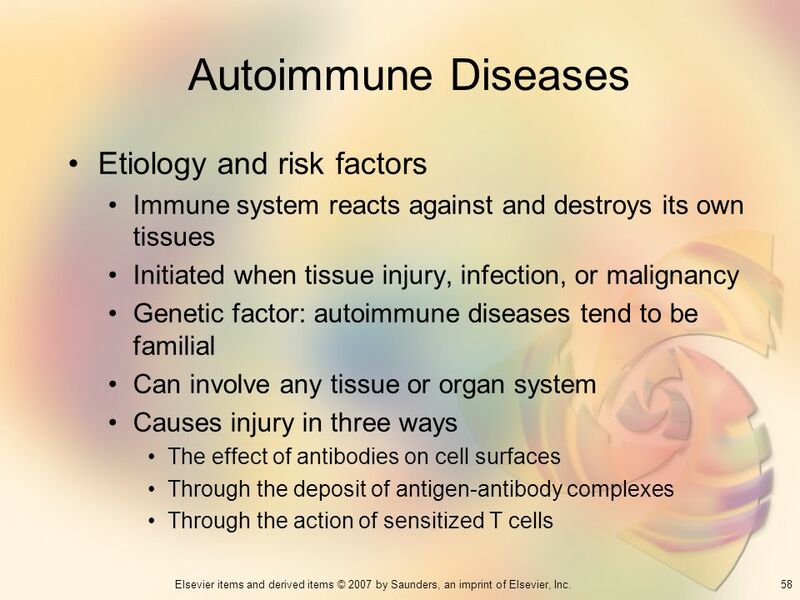 Describe the process of autoimmunity. 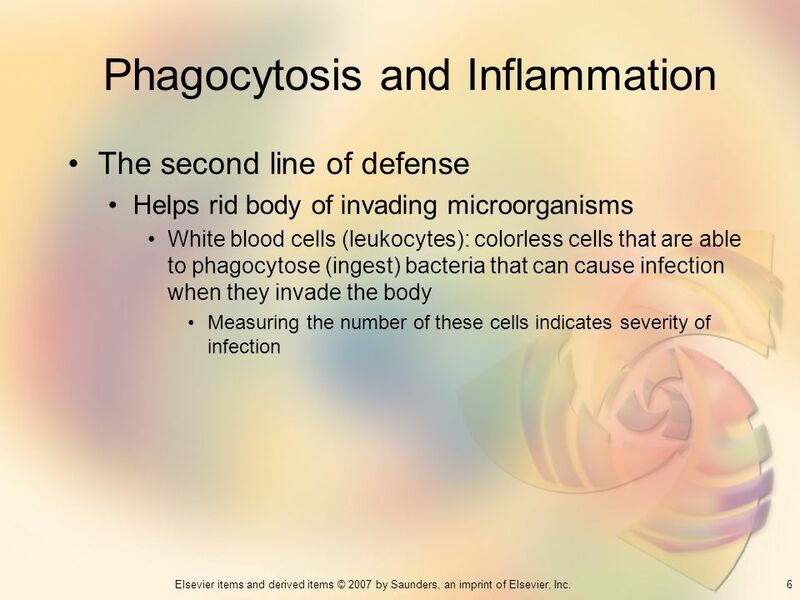 The second line of defense Helps rid body of invading microorganisms White blood cells (leukocytes): colorless cells that are able to phagocytose (ingest) bacteria that can cause infection when they invade the body Measuring the number of these cells indicates severity of infection What are the two types of leukocytes that are especially suited for this purpose? 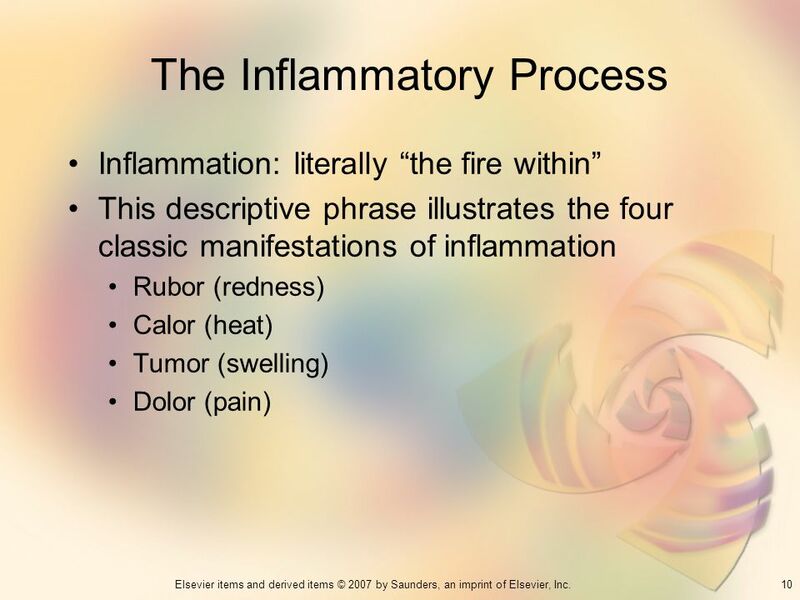 Inflammation: literally “the fire within” This descriptive phrase illustrates the four classic manifestations of inflammation Rubor (redness) Calor (heat) Tumor (swelling) Dolor (pain) These signs are the direct result of several related actions that occur when the inflammatory process is initiated. 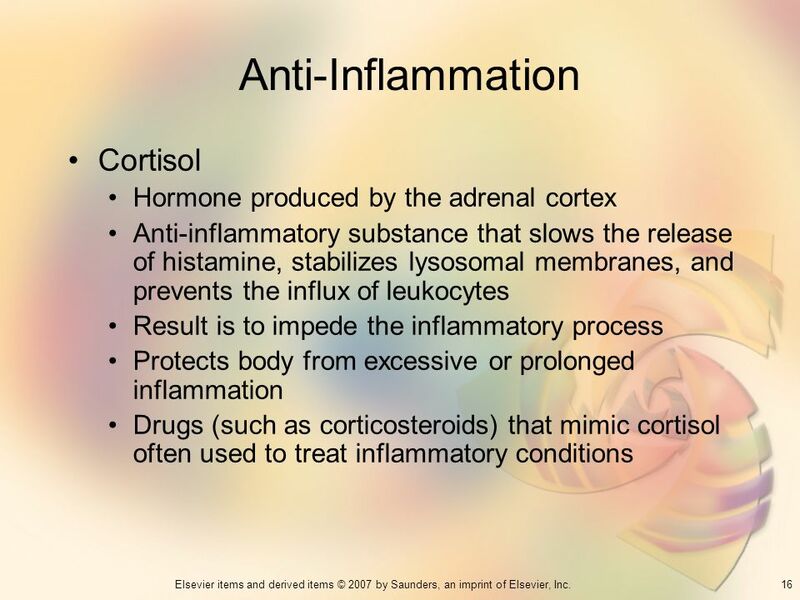 What actions are involved in the inflammatory process? 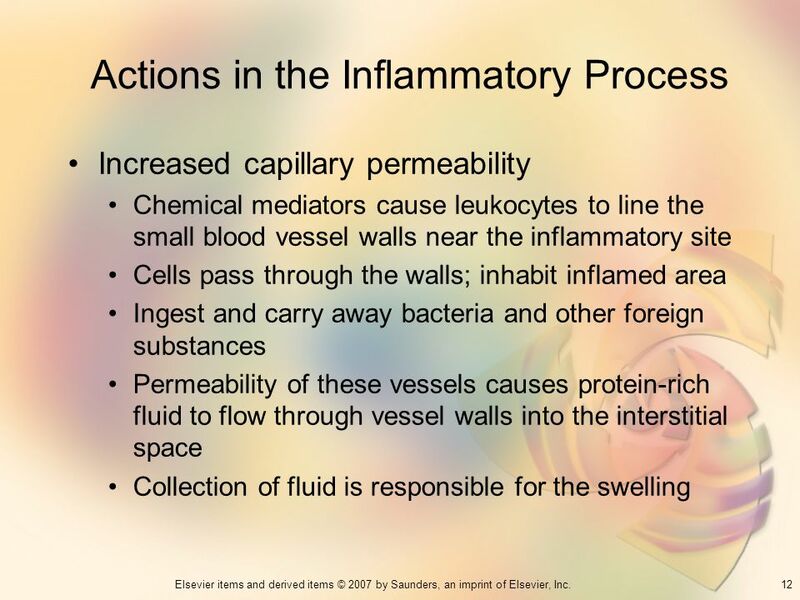 Increased capillary permeability Chemical mediators cause leukocytes to line the small blood vessel walls near the inflammatory site Cells pass through the walls; inhabit inflamed area Ingest and carry away bacteria and other foreign substances Permeability of these vessels causes protein-rich fluid to flow through vessel walls into the interstitial space Collection of fluid is responsible for the swelling What is pavementing? Swelling may also produce pain. Local inflammation Produces the classic signs of heat, swelling, redness, and pain, all of which result in loss of function Systemic inflammation Fever, headache, muscle aches, chills, sweating, and leukocytosis Fever is probably caused by pyrogens or by defense mechanisms that are liberated during phagocytosis, or by bacterial endotoxins, antigen-antibody complexes, and certain viruses. 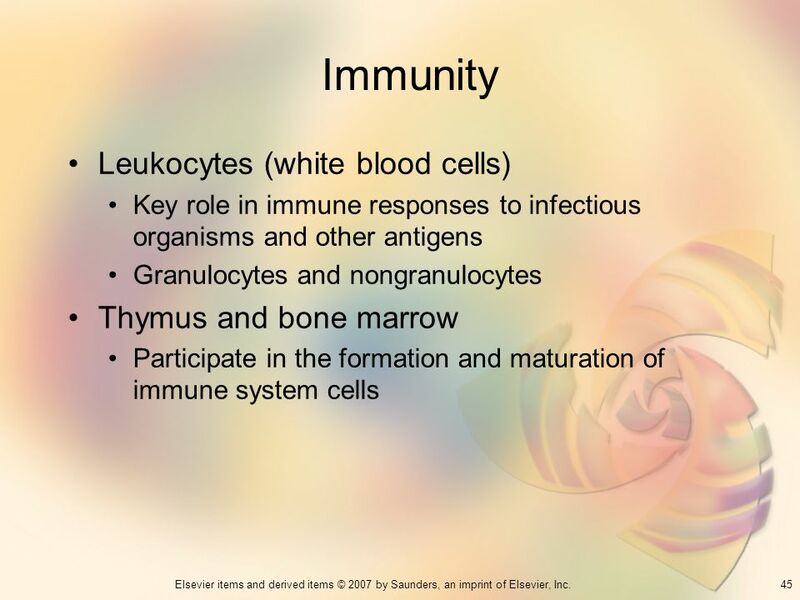 What is leukocytosis? 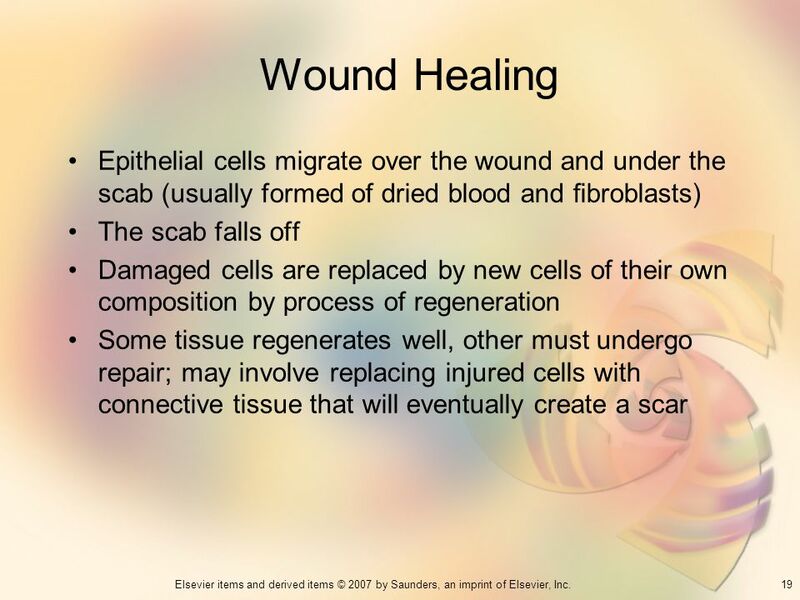 19 Wound Healing Epithelial cells migrate over the wound and under the scab (usually formed of dried blood and ﬁbroblasts) The scab falls off Damaged cells are replaced by new cells of their own composition by process of regeneration Some tissue regenerates well, other must undergo repair; may involve replacing injured cells with connective tissue that will eventually create a scar The age and general health of the person affects how rapidly the regeneration and repair process occurs. 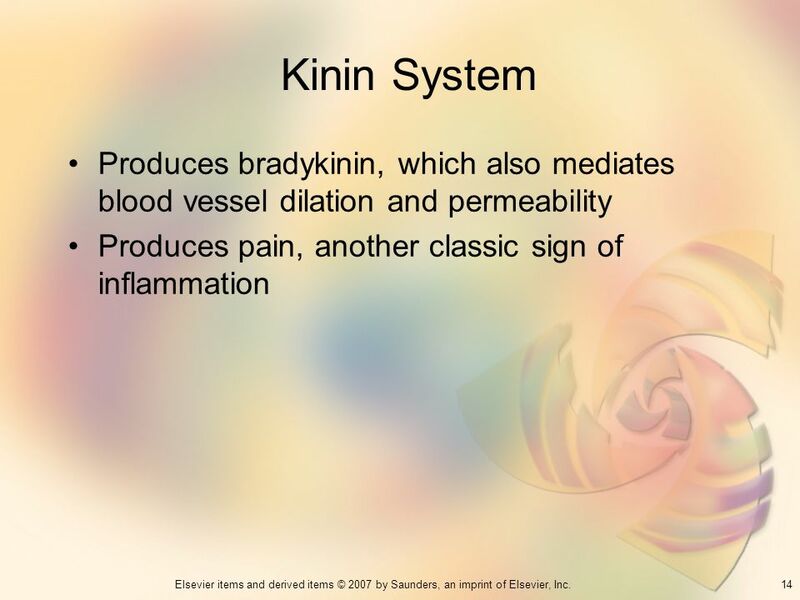 The healing process can be delayed in the older adult as a result of decreased tissue elasticity and decreased blood supply. 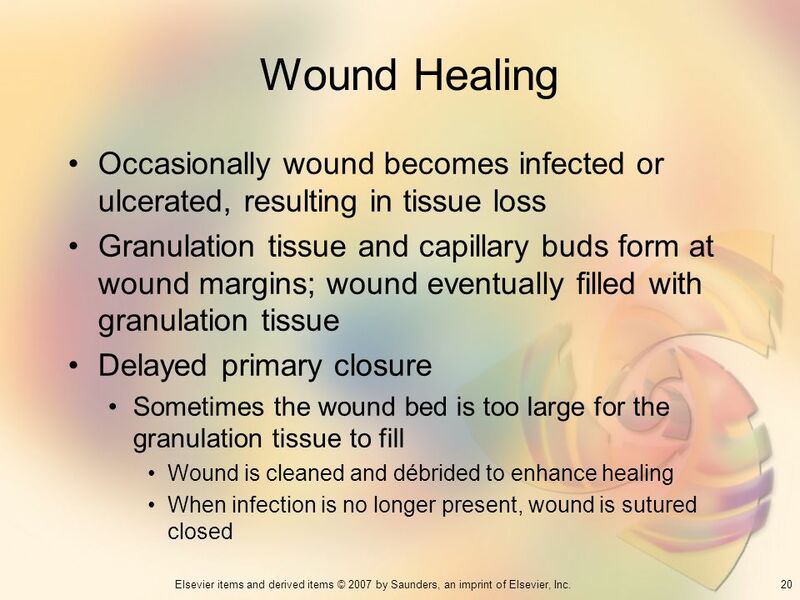 What deficiencies may cause a delay in wound healing? 22 Bacteria One-celled microorganisms capable of multiplying rapidly within a susceptible host Classified as gram positive or gram negative Classified according to shape Round bacteria: cocci Groups of two: diplococci Clusters: staphylococci Chains: streptococci Rod-shaped organisms Fusiform (with tapered ends) Spirochetes (spirals) What may protect the bacteria from phagocytosis? 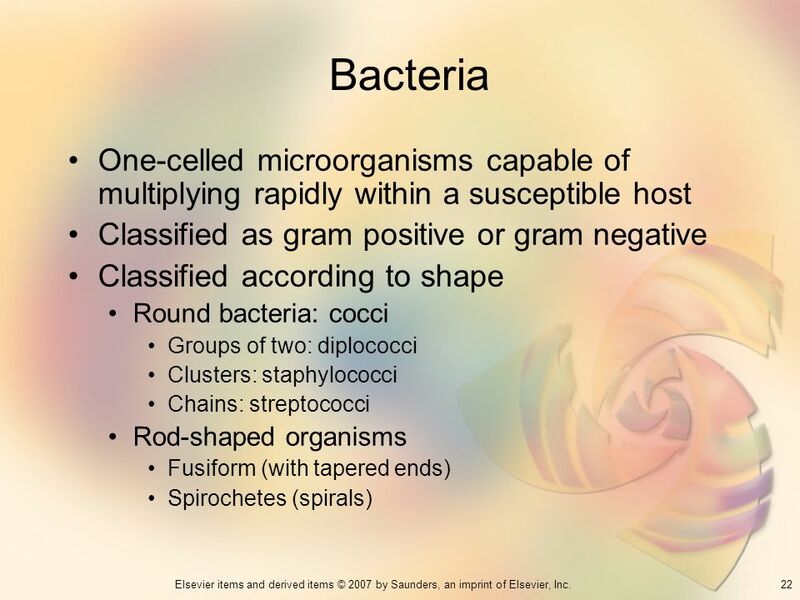 Classification of bacteria as either gram-positive or gram-negative depends on their ability to take up and retain a violet-colored solution called a Gram stain. Gram-positive bacteria retain the stain. Gram-negative bacteria can be decolorized and counterstained pink. 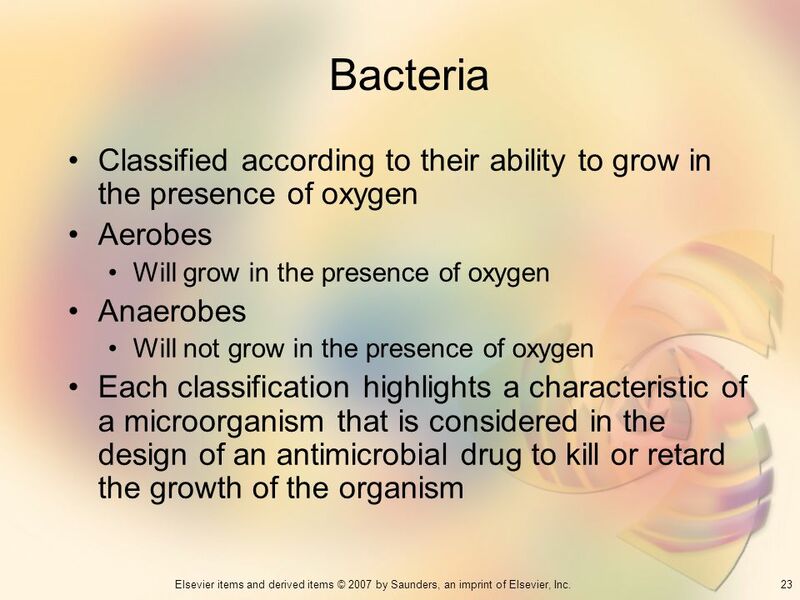 23 Bacteria Classified according to their ability to grow in the presence of oxygen Aerobes Will grow in the presence of oxygen Anaerobes Will not grow in the presence of oxygen Each classification highlights a characteristic of a microorganism that is considered in the design of an antimicrobial drug to kill or retard the growth of the organism What is an example of how a bacteria classification may affect what antimicrobial drug is used? Many of these infections are superficial skin infections that rarely produce serious illness Systemic fungal infections caused by Cryptococcus and Aspergillus species; can be life-threatening Patients with compromised immune systems (e.g., HIV) are at especially high risk of acquiring opportunistic fungal infections Fungal infections are called mycoses What are some examples of fungal organisms? 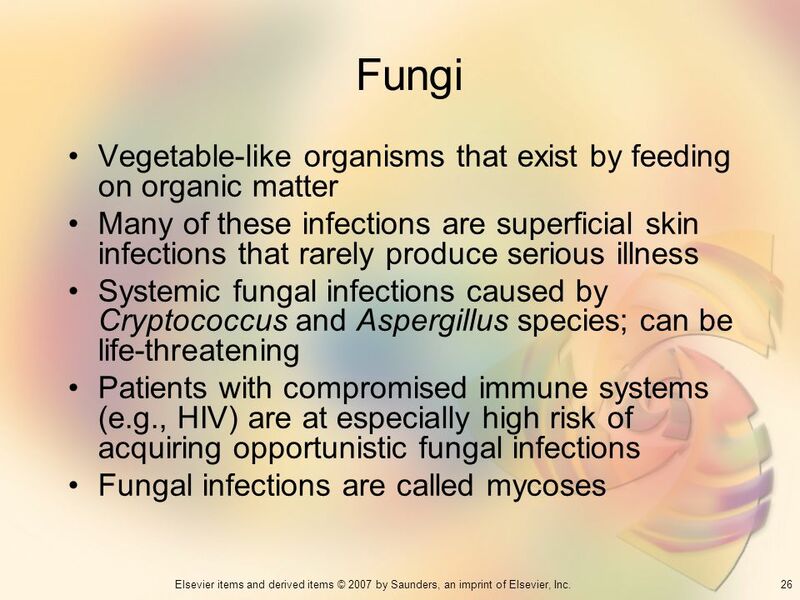 Because fungi tend to form spores that are resistant to many antiseptics and disinfectants, they are difficult to treat. Both systemic and topical antimycotic drugs are used to treat fungal infections. 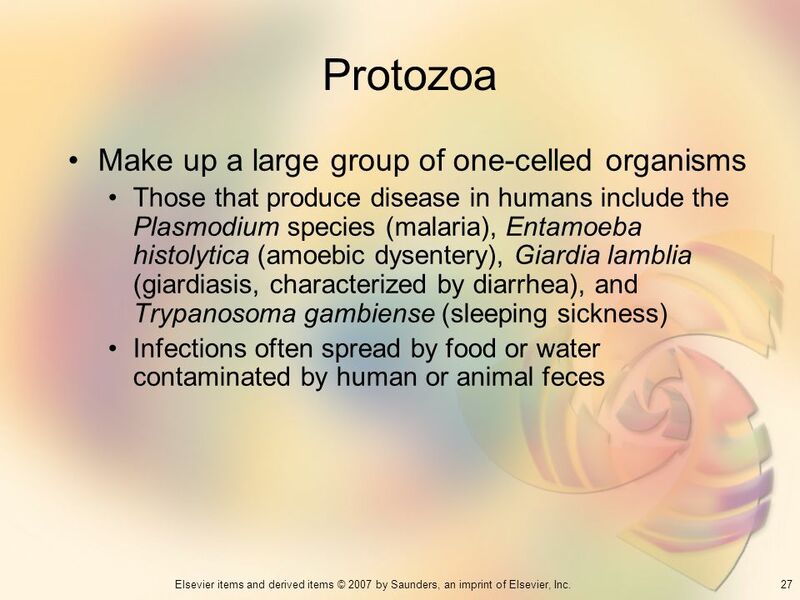 Those that produce disease in humans include the Plasmodium species (malaria), Entamoeba histolytica (amoebic dysentery), Giardia lamblia (giardiasis, characterized by diarrhea), and Trypanosoma gambiense (sleeping sickness) Infections often spread by food or water contaminated by human or animal feces Pneumocystis jiroveci is a protozoal infection that was relatively rare before the onset of the HIV/AIDS epidemic. What causes patients with HIV infection to be at risk for pneumocystic pneumonia? 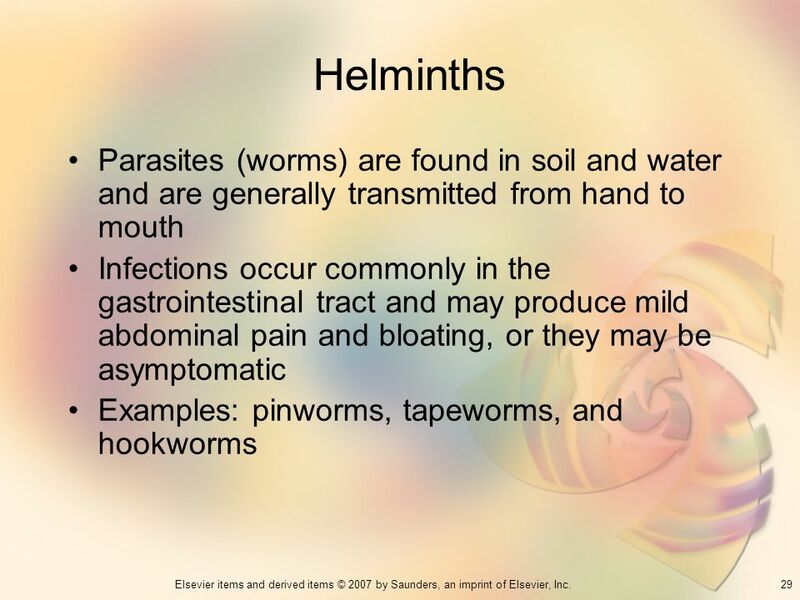 29 Helminths Parasites (worms) are found in soil and water and are generally transmitted from hand to mouth Infections occur commonly in the gastrointestinal tract and may produce mild abdominal pain and bloating, or they may be asymptomatic Examples: pinworms, tapeworms, and hookworms What are the symptoms of pinworms? Tapeworms? Hookworms? Tapeworms can be found in the gastrointestinal tract. Hookworms often enter an individual through the soles of the feet and migrate throughout the body. 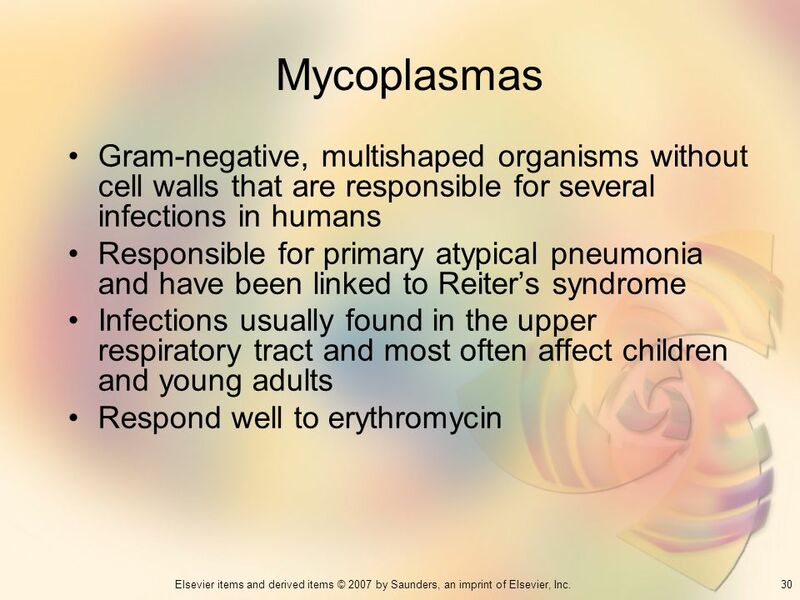 30 Mycoplasmas Gram-negative, multishaped organisms without cell walls that are responsible for several infections in humans Responsible for primary atypical pneumonia and have been linked to Reiter’s syndrome Infections usually found in the upper respiratory tract and most often affect children and young adults Respond well to erythromycin Reiter’s syndrome is a multisystem inﬂammatory disease that may be associated with urethritis, conjunctivitis, and pharyngitis. What are pleuropneumonis-like organisms? 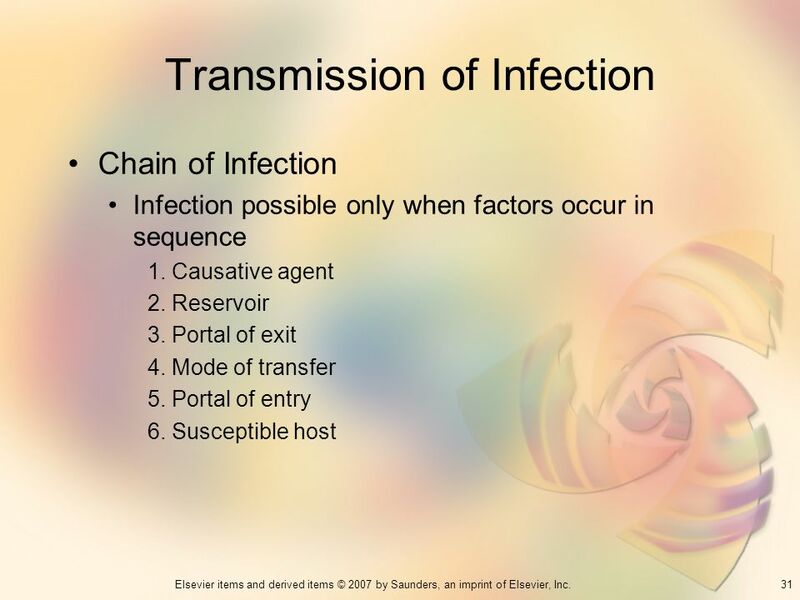 Chain of Infection Infection possible only when factors occur in sequence 1. Causative agent 2. Reservoir 3. Portal of exit 4. Mode of transfer 5. Portal of entry 6. 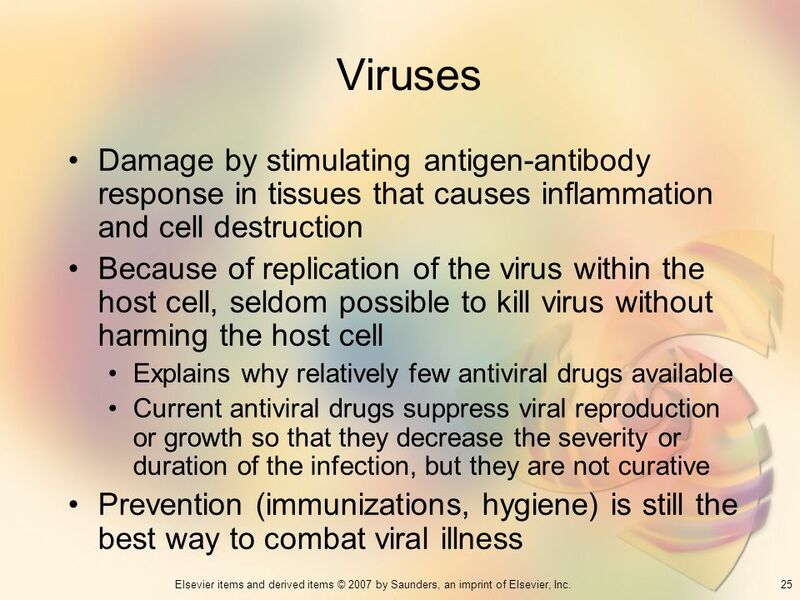 Susceptible host Causative agents are the microorganisms that are present in sufficient number and virulence to damage human tissue. Areas in which organisms can pool and reproduce are called reservoirs. Portal of exit refers to the route by which the infectious agent leaves one host and travels to another. Mode of transfer refers to the means by which a microorganism is transported to a host. Portals of entry are the doorways or pathways into the host. Microorganisms must become implanted into a susceptible host. What are examples of each of these factors? Localized infections Redness, pain, warmth, swelling, and pus Generalized infections May not show all signs apparent in localized infections Pain may be mild to severe depending on its location Warmth is generally expressed as fever Malaise Anorexia Prostration Once an individual becomes infected with a pathogen, symptoms may or may not be apparent. 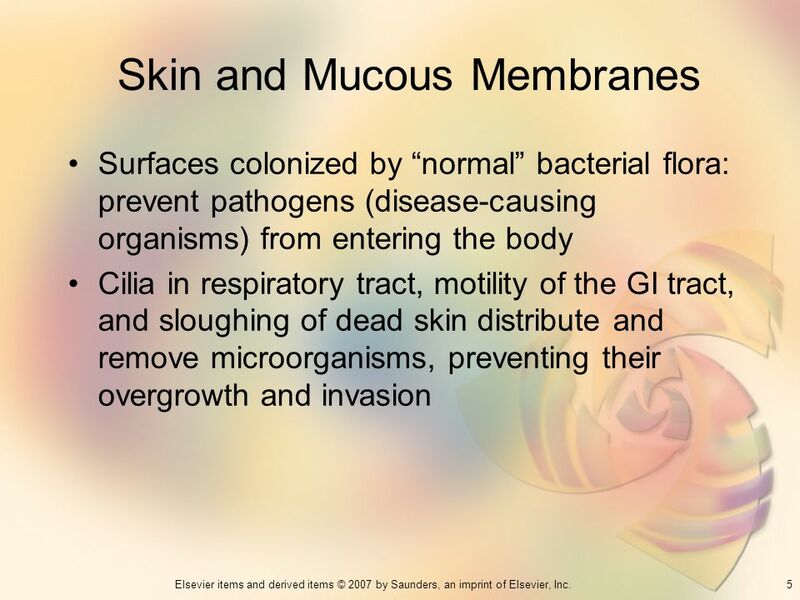 What is a subclinical infection? Asymptomatic carriers may inadvertently infect others. 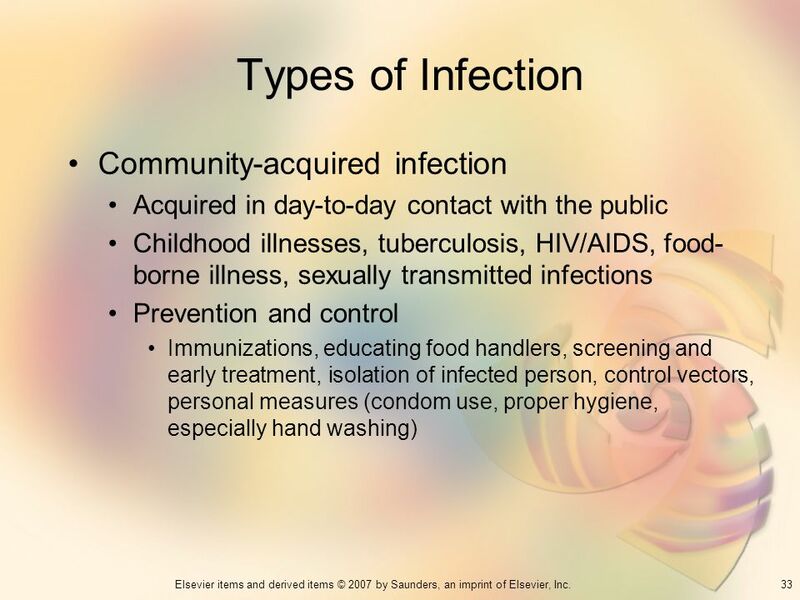 Acquired in day-to-day contact with the public Childhood illnesses, tuberculosis, HIV/AIDS, food-borne illness, sexually transmitted infections Prevention and control Immunizations, educating food handlers, screening and early treatment, isolation of infected person, control vectors, personal measures (condom use, proper hygiene, especially hand washing) Many viral infections are pervasive in society and occur at predictable times of the year. When are common childhood illnesses most prevalent? Food-borne illnesses? Poverty, low immunization rates, overcrowding, unsanitary living conditions, and resistant strains of pathogens are at least partially responsible for the increase in infectious diseases that were once well controlled. Occur within a health care facility; may affect patient as well as health care worker Strains of bacteria in hospital usually more virulent and often resistant to antibiotics Some pathogenic bacteria that are no longer susceptible to previously effective antibiotics are found in hospital patients Vancomycin-resistant enterococcus (VRE) is one example; the incidence of vancomycin resistance in patients with a nosocomial enterococcal infection is rapidly increasing. 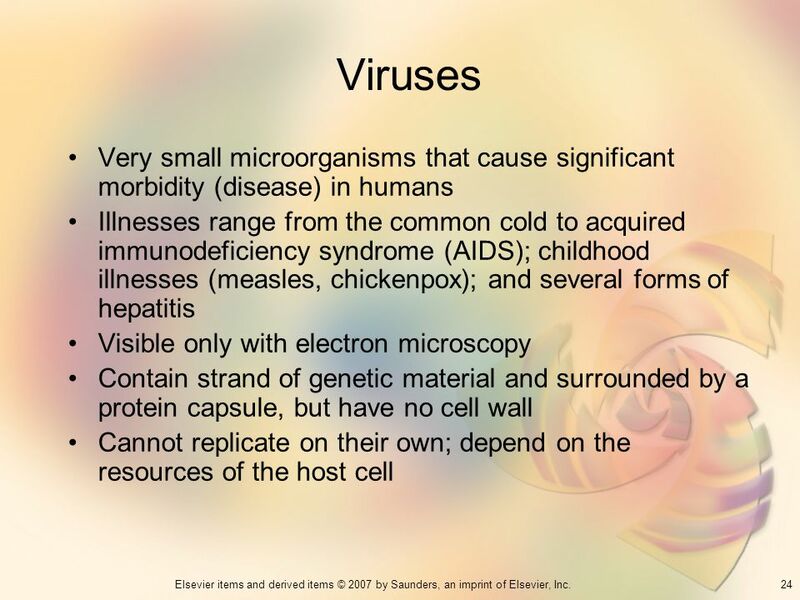 What measures may prevent the spread of VRE? 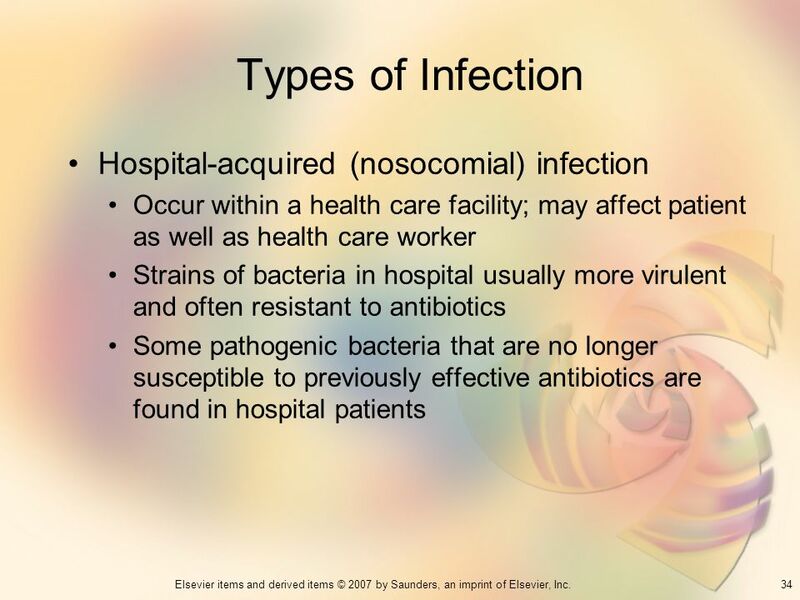 Iatrogenic infections are caused by the treatment given the patient. 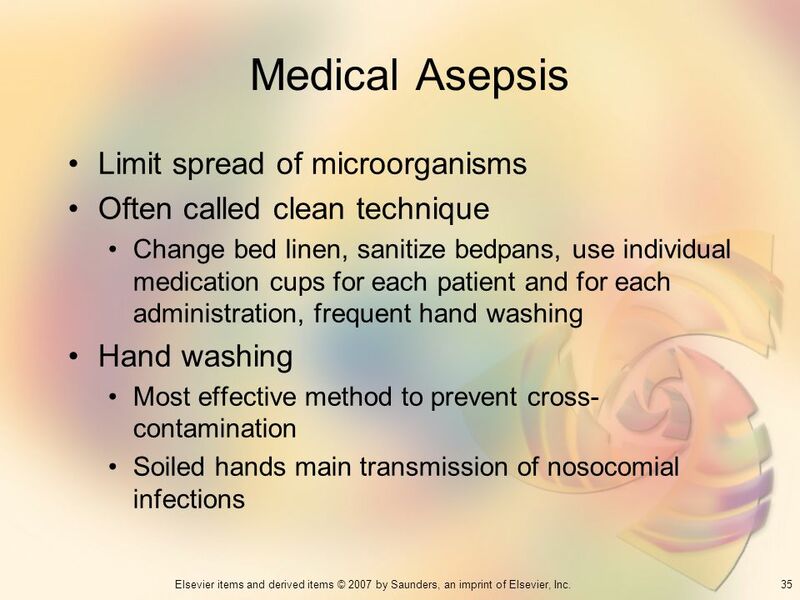 Often called clean technique Change bed linen, sanitize bedpans, use individual medication cups for each patient and for each administration, frequent hand washing Hand washing Most effective method to prevent cross-contamination Soiled hands main transmission of nosocomial infections What three things should be used for good hand washing? 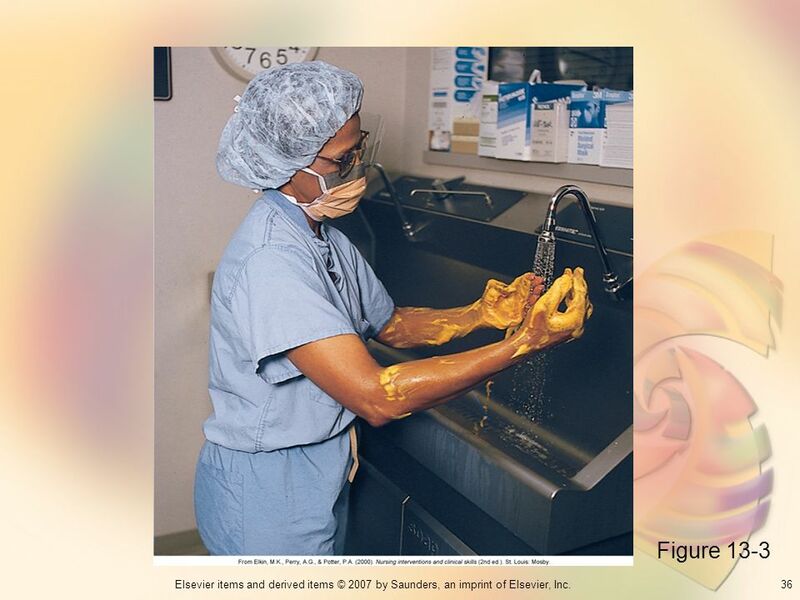 The use of antimicrobial soaps is also recommended when working with patients who are more susceptible to infection, such as premature infants or immunocompromised patients. 38 Standard Precautions Infection control guidelines for hospitals and other health care agencies from Hospital Infection Control Practices Advisory Committee (HICPAC) and CDC For all patients in hospitals regardless of their isolation status Use when you will have contact with a patient’s blood, bodily fluids, secretions (except sweat), excretions, broken skin, and mucous membranes Use when you have contact with materials that are soiled or contaminated with bodily fluids or blood The current guidelines, called standard precautions, combine the major features of universal precautions and body substance isolation precautions. Use standard precautions with all patients, no matter what their diagnosis or infectious status may be. What are the guidelines for the use of standard precautions? Airborne precautions Used with diseases that are spread through the air Droplet precautions Used with infections that are spread by droplets or dust particles containing the infectious agent Contact precautions Used when caring for patients who are infected by microorganisms that are transmitted by direct (skin-to-skin) or indirect contact with contaminated equipment What are examples of disease spread through the air? Droplets? Contact? Surgical masks filter expired air; respirators such as the HEPA filter respirator and the N95 respirator filter inspired air. Droplets are spread primarily during coughing, sneezing, or talking and during certain procedures such as suctioning and bronchoscopy. Needles, dressings, stethoscopes, bed rails, and doorknobs may become contaminated and cause the spread of microorganisms by contact. 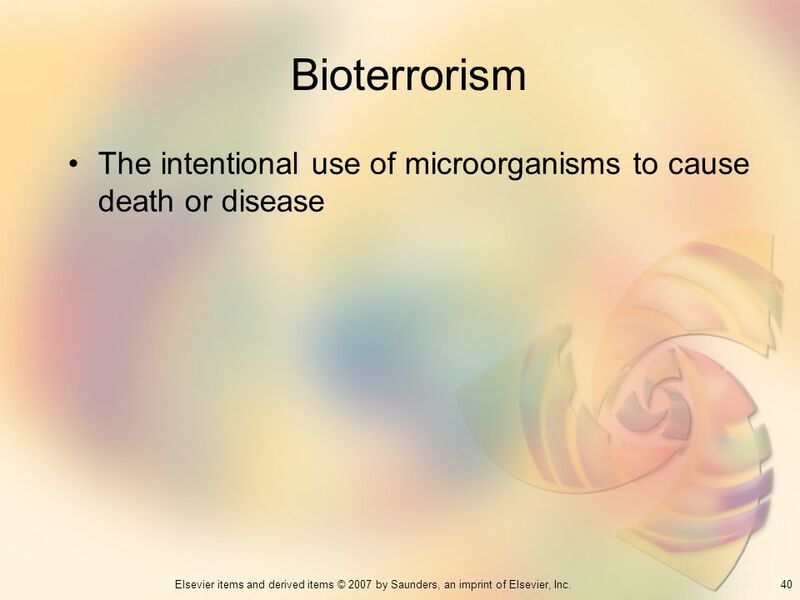 40 Bioterrorism The intentional use of microorganisms to cause death or disease Methods used to spread agents of bioterrorism are varied and might include powders, aerosols, or contamination of food or water. What are some agents that may be used in bioterrorism? Nurses should be aware of their employing agency’s plans for dealing with public exposure to bioterrrorism agents, including decontamination procedures and personal protective equipment and procedures. 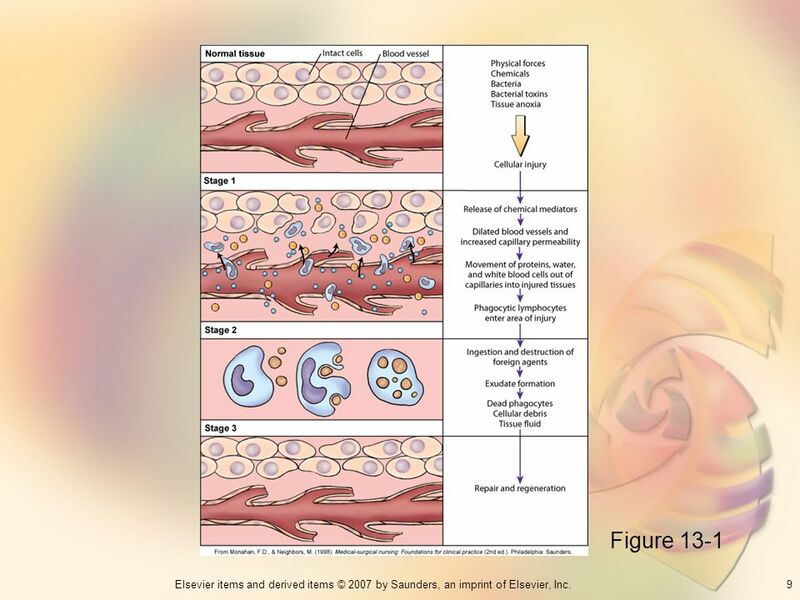 Decreased immunity to infection; are at increased risk for bacterial, fungal, parasitic, and viral infections Patients receiving chemotherapy and other patients with low white blood cell counts are at increased risk of infection. 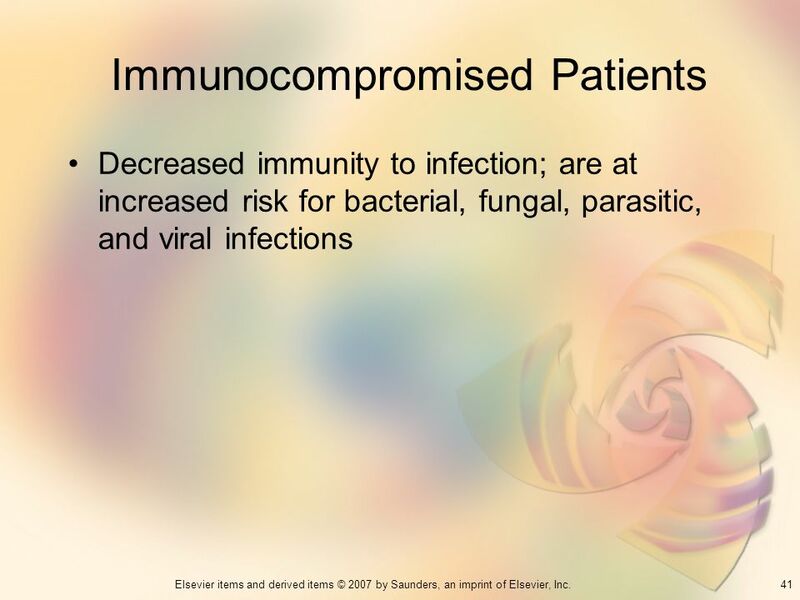 What diseases may cause a patient to be immunocompromised? 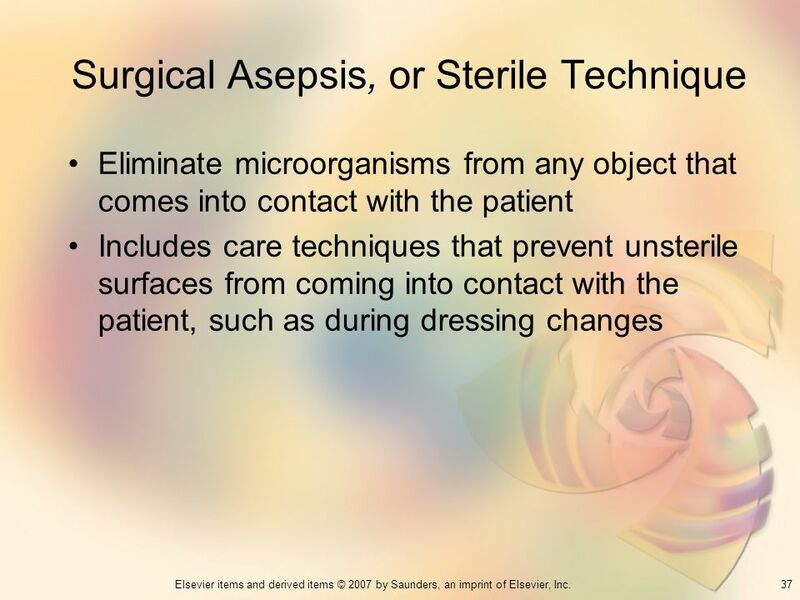 The use of standard precautions for all patients and of transmission-based precautions for specific situations should reduce the risk of acquiring infections from other persons and from the environment. Urge the patient to consume adequate fluids Encourage to consume high-protein, high-vitamin diet Isolation, if required Laboratory tests White blood cell count with differential; erythrocyte sedimentation rate; iron level; cultures of urine, blood, wound, sputum, and throat Administer antibiotic drug therapy Hyperbaric oxygen therapy Fluid intake is important in the transportation of nutrients to the cells to fight infection. How much fluid intake should a patient have each day? 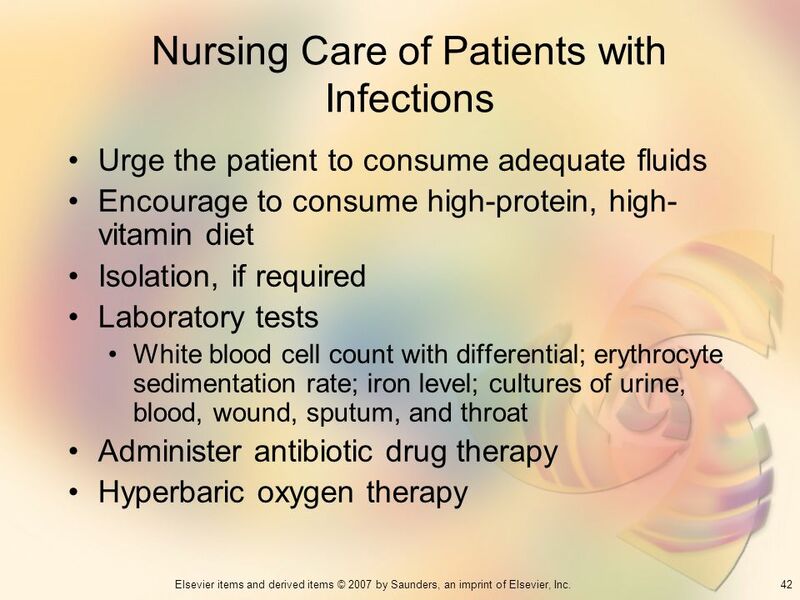 Examples of nursing diagnoses for patients with infections or for patients who are vulnerable to infections include Risk for Infection, Risk for Injury, Impaired Tissue Integrity, Social Isolation, and Disturbed Body Image. Caution patients not to stop taking the medication when they start feeling better. 43 Immunity Provides resistance to invading organisms; enables body to fight off invaders once they have gained access Antigen Any substance capable of stimulating a response from the immune system Usually foreign; body recognizes it because it’s different Antibodies Also known as immunoglobulins Proteins are created in response to specific antigens If the immune system is intact and functioning properly, it is able to provide adequate protection from most infections and diseases in a healthy individual. What are some factors that may compromise the immune system? 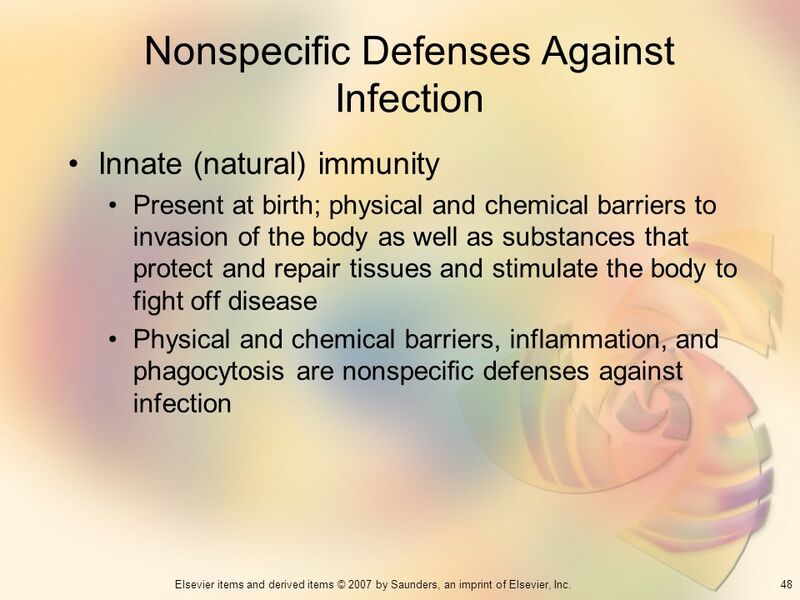 Once the body recognizes a substance as an antigen, natural and acquired defenses are put into action to destroy the invader and prevent disease. Present at birth; not dependent on a specific immune response or previous contact with an infectious agent Acquired immunity Develops after birth as a result of the body’s natural immune responses to antigens Depends on the proper development and functioning of B and T lymphocytes Developed after direct contact with an antigen through illness or vaccination What factors may influence innate immunity? 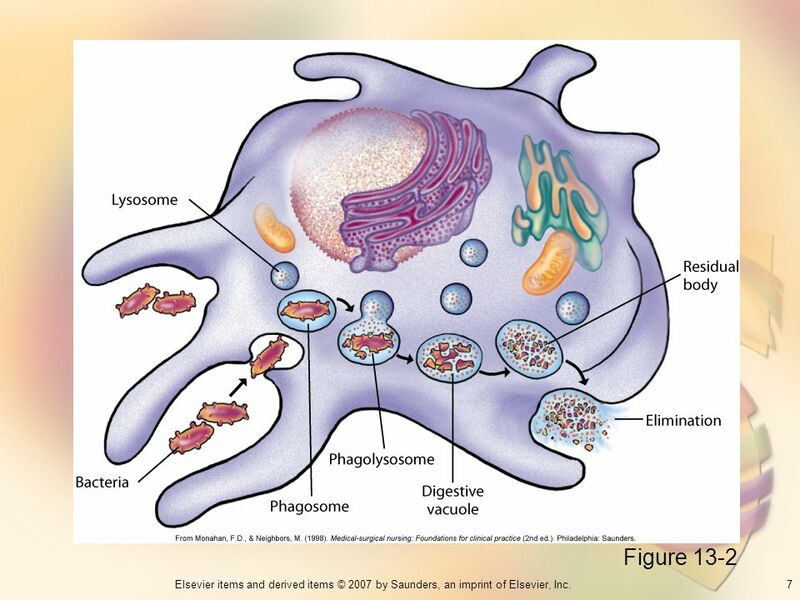 Nonspecific defense mechanisms, including physical and chemical barriers to infection, phagocytosis and the inflammatory process, contribute to natural immunity. Once the body has been exposed to an antigen through illness or vaccination, antibodies develop and retain memory for the antigen. If the body is exposed to the same antigen later, the antibodies can react quickly to fight off disease. Innate (natural) immunity Present at birth; physical and chemical barriers to invasion of the body as well as substances that protect and repair tissues and stimulate the body to fight off disease Physical and chemical barriers, inflammation, and phagocytosis are nonspeciﬁc defenses against infection Other nonspecific defenses against infection that protect the body include complement, pyrogen, and interferon. 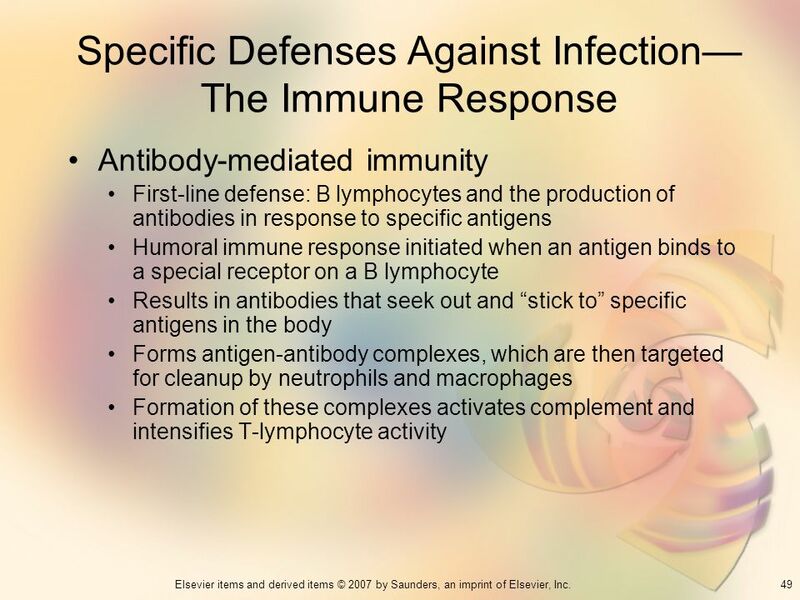 How do complement, pyrogen and interferon assist with defense against infections? Antibody-mediated immunity First-line defense: B lymphocytes and the production of antibodies in response to specific antigens Humoral immune response initiated when an antigen binds to a special receptor on a B lymphocyte Results in antibodies that seek out and “stick to” specific antigens in the body Forms antigen-antibody complexes, which are then targeted for cleanup by neutrophils and macrophages Formation of these complexes activates complement and intensifies T-lymphocyte activity What are the five classes of antibodies (immunoglobulins)? Cell-mediated immunity A delayed response to injury or infection because of time needed for migration of T cells and production of substances that enhance the immune response and influence the destruction of antigens Fights most viral or bacterial infections and hinders the growth of malignant cells This process also launches an attack on transplanted tissue or organs in the body What three types of cells do T cells include? 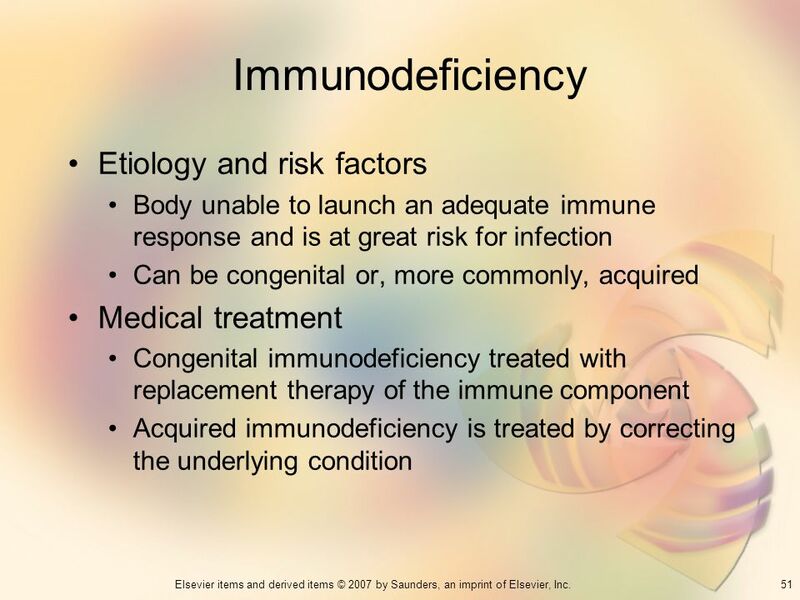 Body unable to launch an adequate immune response and is at great risk for infection Can be congenital or, more commonly, acquired Medical treatment Congenital immunodeficiency treated with replacement therapy of the immune component Acquired immunodeficiency is treated by correcting the underlying condition What is the primary clinical clue to immunodeficiency? Stress, whether physical or emotional, alters the body’s response to disease. 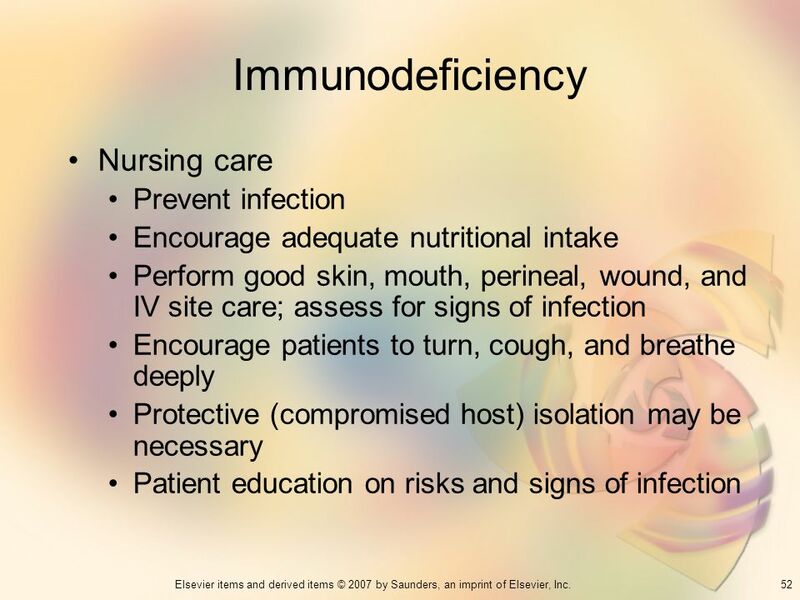 Encourage adequate nutritional intake Perform good skin, mouth, perineal, wound, and IV site care; assess for signs of infection Encourage patients to turn, cough, and breathe deeply Protective (compromised host) isolation may be necessary Patient education on risks and signs of infection What is the single most important measure in prevention? A small increase in body temperature in these patients can be significant and should be reported. 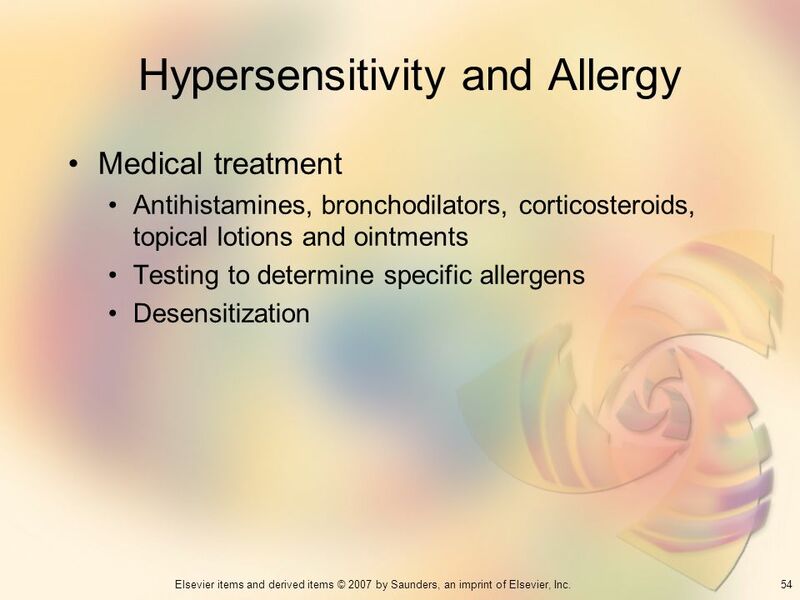 Medical treatment Antihistamines, bronchodilators, corticosteroids, topical lotions and ointments Testing to determine specific allergens Desensitization What are the side effects of antihistamines? Testing is performed by injecting small amounts of allergen under the skin (intradermally) or by pricking the surface of the patient’s skin and monitoring for the degree of wheal-and-flare reaction. 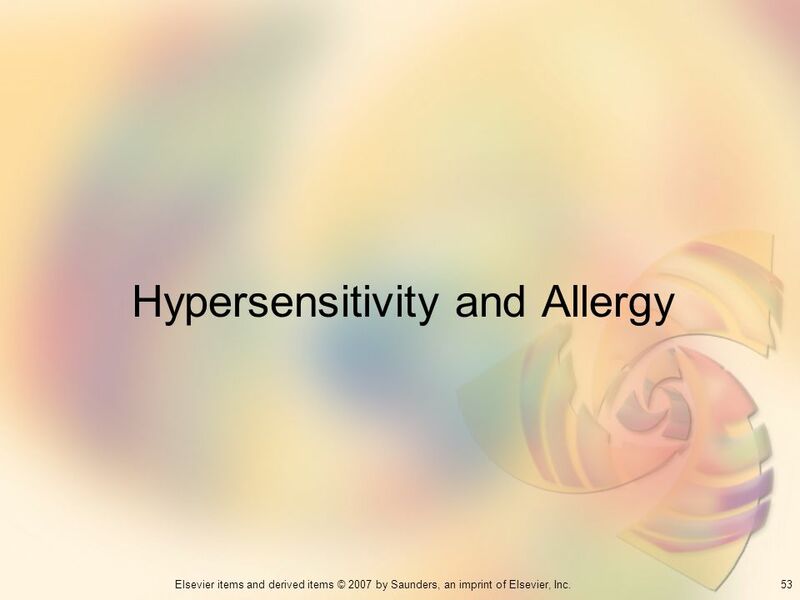 Desensitization is aimed at increasing tolerance to the offending agent and decreasing the severity of the allergic response. Nursing care Document all allergies, symptoms they cause, and any treatment currently used Education is important for all patients with allergies Specific allergens, limiting exposure to or avoiding allergens, the proper use of medications such as inhaled bronchodilators, and the actions and side effects of drugs Never administer any drug to which the patient reports a previous allergic reaction. Where should patient allergies be posted? Patients who are at risk for life-threatening (anaphylactic) reactions should wear a medical alert bracelet that identifies their allergy. 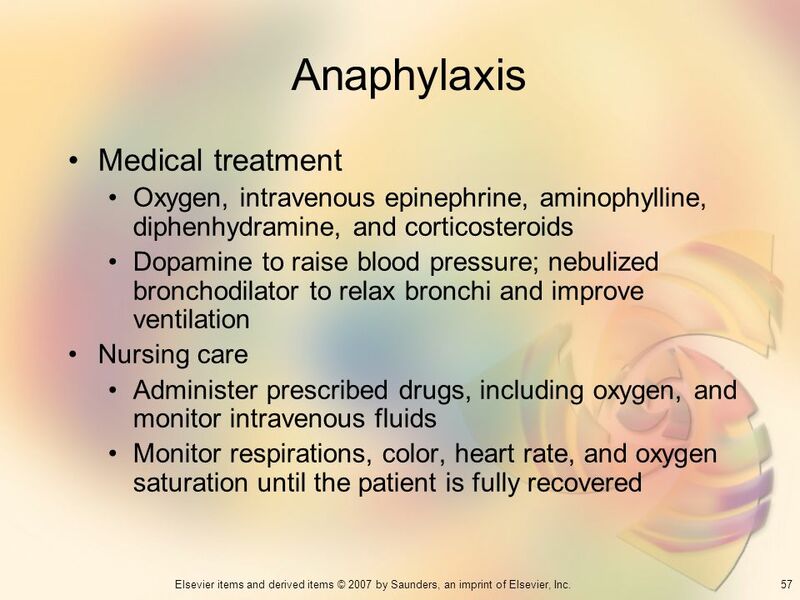 Individuals with insect sting allergies should obtain an emergency sting kit and be taught how to self-inject epinephrine. Life-threatening; can quickly deteriorate into shock, coma, and death Histamine released causes bronchospasm, vasodilation, and increased capillary permeability, which causes fluid to leave the circulation and enter the tissues, causing shock from hypovolemia Signs and symptoms of anaphylaxis include anxiety, wheezing and difficulty breathing, cyanosis, hives, facial edema, arthralgia, and hypotension Anaphylaxis is an emergency situation, and the patient’s life depends on rapid intervention. 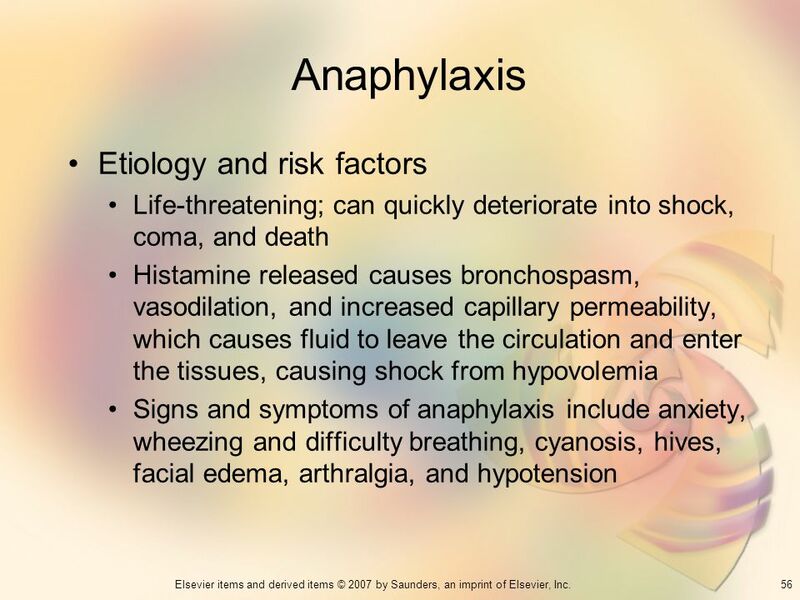 What is the most common cause of anaphylaxis? Oxygen, intravenous epinephrine, aminophylline, diphenhydramine, and corticosteroids Dopamine to raise blood pressure; nebulized bronchodilator to relax bronchi and improve ventilation Nursing care Administer prescribed drugs, including oxygen, and monitor intravenous fluids Monitor respirations, color, heart rate, and oxygen saturation until the patient is fully recovered The best care is to prevent anaphylaxis whenever possible by obtaining a history of allergies and taking precautions to protect the patient from substances (often drugs) that may trigger this reaction. Immune system reacts against and destroys its own tissues Initiated when tissue injury, infection, or malignancy Genetic factor: autoimmune diseases tend to be familial Can involve any tissue or organ system Causes injury in three ways The effect of antibodies on cell surfaces Through the deposit of antigen-antibody complexes Through the action of sensitized T cells The exact causes and pathology of most autoimmune diseases are poorly understood, but many of these disorders cause severe illness and death. 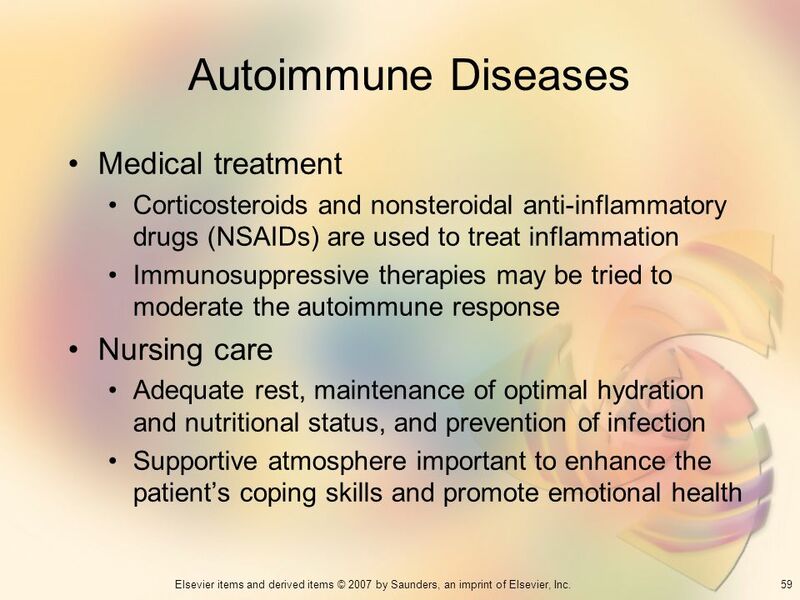 What are examples of autoimmune diseases? 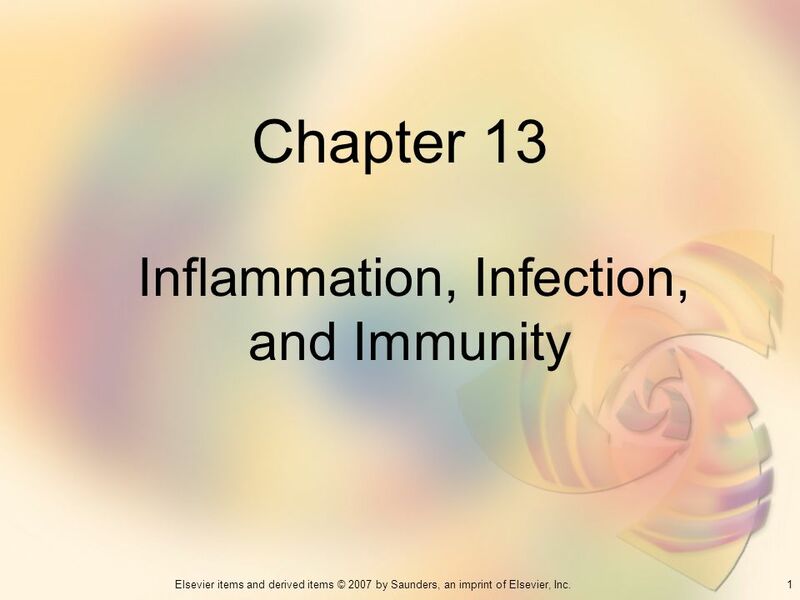 Download ppt "Inflammation, Infection, and Immunity"
KEY CONCEPT 31.1 Germs cause many diseases in humans. The Immune system Biology II: Form and Function. 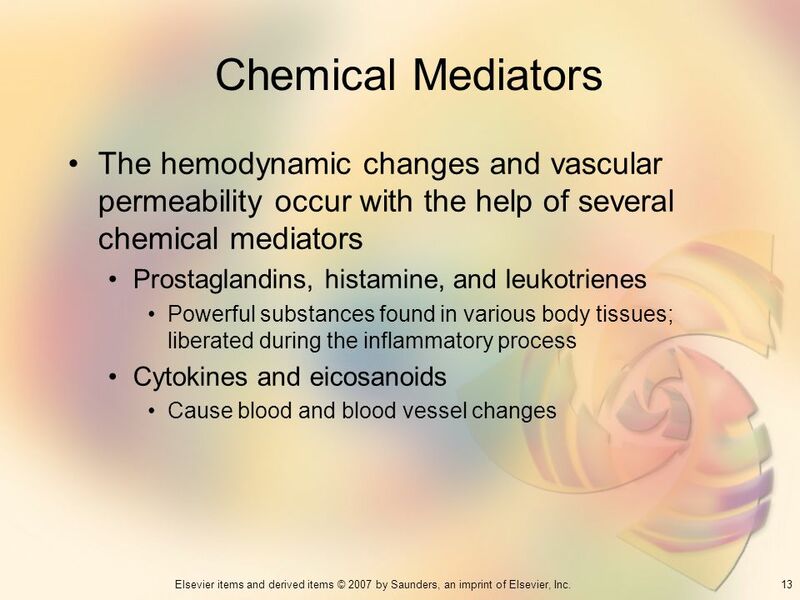 The Immune System Nonspecific defense mechanisms –Physical barriers (skin, mucous membranes –Internal. The Chain of Infection How does Infection Occur?. 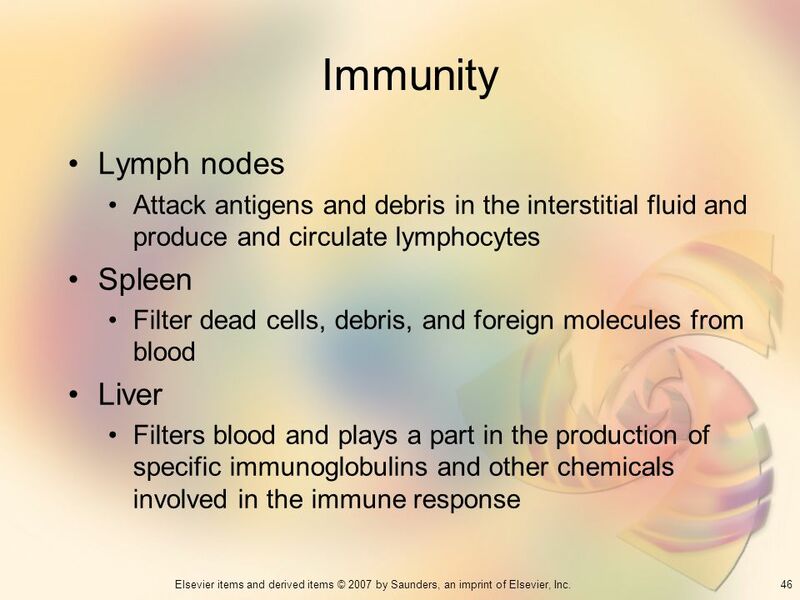 Immune System SC.912.L Explain the basic functions of the human immune system, including specific and nonspecific immune response, vaccines, and. Permission granted to reproduce for educational use only.© Goodheart-Willcox Co., Inc. Organization of the Lymphatic System. 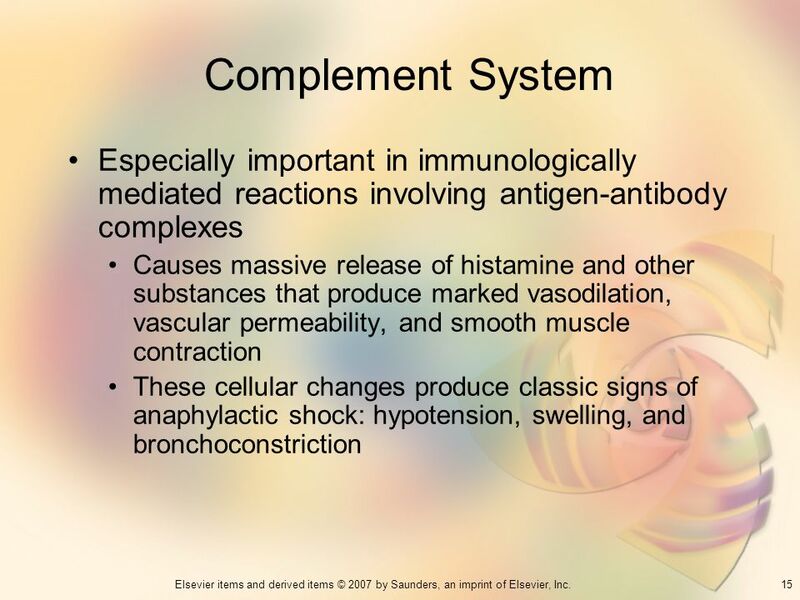 The Immune System Non-Specific Immunity. What You Should Know The human body has the capacity to protect itself against pathogens, some toxins and cancer. KEY CONCEPT Germs cause many diseases in humans. Chapter 37.  How might disease organisms be spread to the people in the setting below? Nonspecific Defenses Adriana Perta Marisa Pawlowski Paige Simko Rachel Ragone Jill Ross. 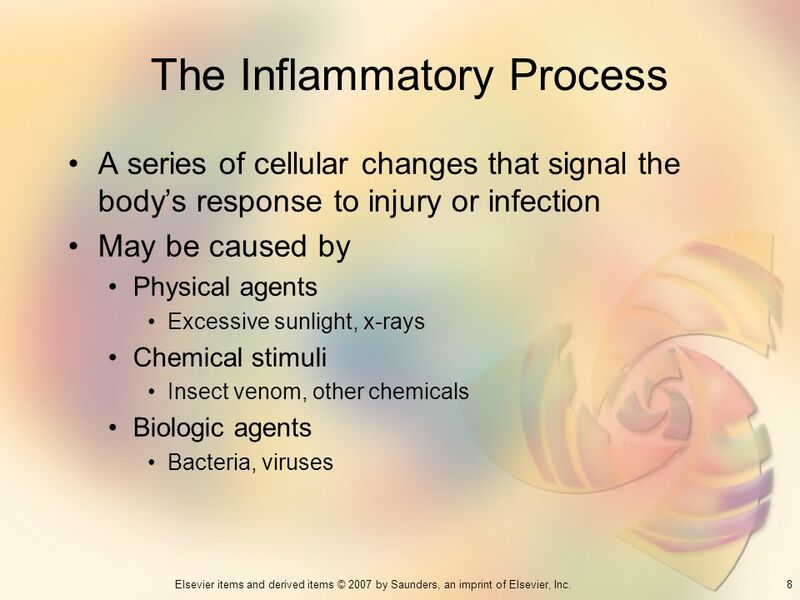 An Overview of the Body’s Defenses. 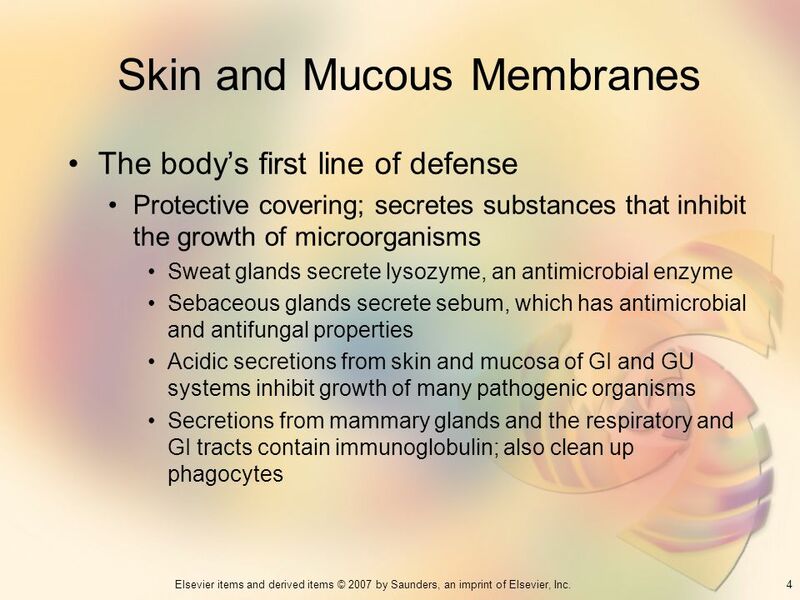 The first line of defense, the skin and mucous membranes, prevents most microbes from entering the body. Immunology BIT 120 Chapters 11. 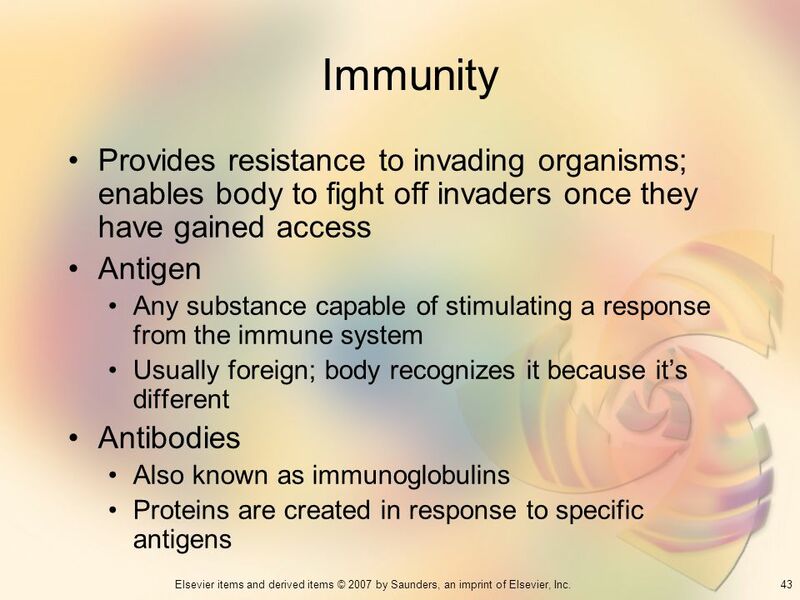 Immunity Ability of body to defend against infectious agents, foreign cells, abnormal cells Antigen: foreign substance/molecule.